I hadn't been to Eight Mile Spring for a long time and wanted to see if there were any mustangs coming into water there. It's been really dry so there were a lot of tracks on every trail coming to the spring. I located about ten head of paints about two miles up the country, too far away to get a good count. Over the mountain at Brown Spring I found plenty of water. Down in the flats I counted forty head of mustangs through the glasses. The next stop was Davis Mountain where I found my friend Val in among 120 head of mustangs. We had a good visit and took a lot of pictures, even though it was cloudy. No Sun,, No good Pictures. I came around a rock on the ledge that was about eight feet wide, they didn't seem to want to turn around, so I did. Gypsy's second colt. I've been watching her all summer, thinking she looked like she could have a colt even though she had the "birth control brand" on her hip. I found out two days later she did drop a colt. I'd been trying to get a picture of her with her head up for half an hour. When she finally did, she looked pretty disgusted for being interrupted. 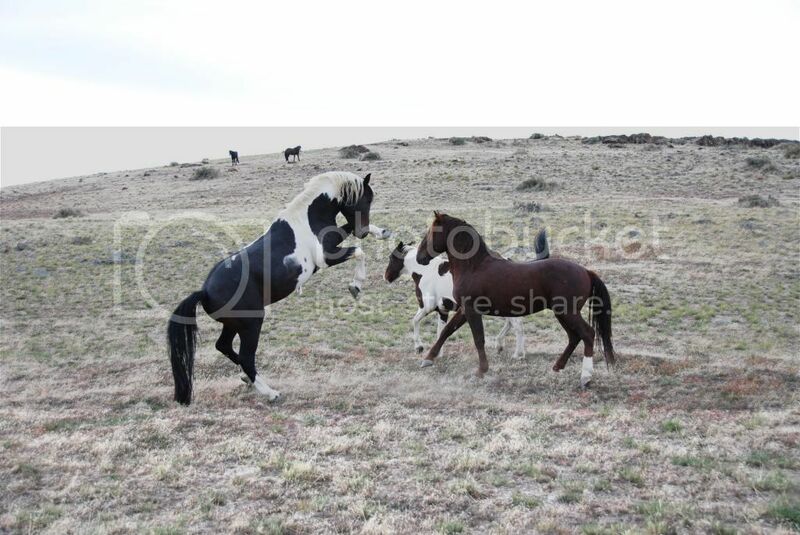 Gypsy's fourth colt trying to get out of the way of some big teeth. A litttle fit of temper. This old boy has been around for a long time and usually doesn't cause much excitement.